In a summary of high-level statistics for 2015, Class Central reports that the number of students who have signed up for at least one course surpassed 35 million in 2015, up from an estimated 16-18 million the previous year. This hierarchy is also visible when considering provider market share in terms of courses offered. 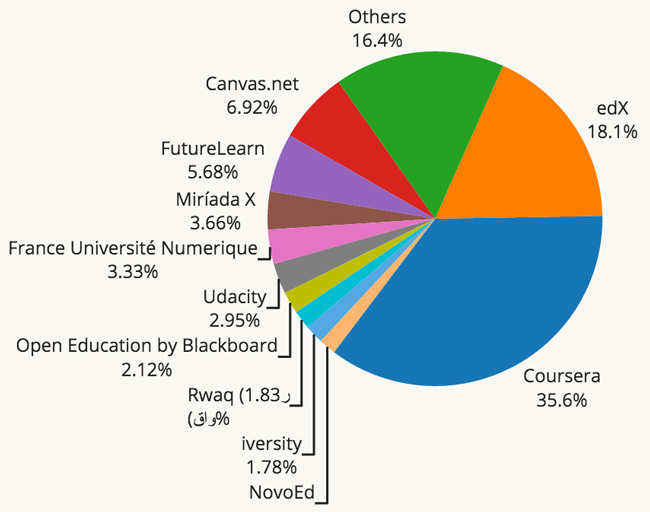 As the following chart reflects, Coursera is again the clear leader and offered more than a third of all available MOOCs as of 2015. edX is the second-ranked provider with just over 18% of all courses. There is, however, a notable drop-off in terms of course distribution after those two market leaders: the Canvas network comes in third with 6.92% of courses, followed closely by FutureLearn at 5.68%. The number of universities offering courses via MOOC platforms exceeded 500 in 2015, up from 400 the year before. Class Central reports as well that 1,800 new MOOCs were offered in 2015, taking the number of total courses introduced (since late-2011) to 4,200 as of this month. The continuing growth of non-English platforms, most notably the French government-backed France Université Numerique (FUN) and the Spanish platform Miriada X. Perhaps not surprisingly, given the prominence of both of these providers, Spanish and French are the most common languages-of-instruction for MOOCs after English. The major US-based MOOC platforms, including Coursera, are now explicitly targeting international markets and are expanding their course offerings in languages other than English. On a related note, one of the factors behind FutureLearn’s significant growth last year was a course aimed at international students that has been billed as “the world’s largest single session of a MOOC.” “Understanding IELTS: Techniques for English Language Tests,” an exam preparation course offered in collaboration with the British Council, registered a reported 440,000 students in 2015. 2015 also marked the continuation of another important trend whereby major MOOC providers are stepping back from offering free certificates in favour of paid credentials and courses for credit. We have reported on a number of examples of alternative credentials over the last couple of years, including those proprietary to specific platforms such as edX’s XSeries programme, Coursera’s Specializations, and Udacity’s Nanodegrees. Each of the major providers is also moving to introduce new for-credit options, where the programmes are delivered via the MOOC platform in collaboration with a university partner and where the institutional partner awards the resulting academic credits or degree. Examples include Udacity’s high-profile partnership with the Georgia Institute of Technology to deliver Georgia Tech’s master’s degree in Computer Science. The MOOC version costs US$6,600 (as compared to US$45,000 price tag for the on-campus programme) and has so far registered nearly 3,000 students and graduated 20. Coursera, meanwhile, has partnered with the University of Illinois to offer an “iMBA” programme priced at US$20,000 (again notably below the cost of the on-campus equivalent). And edX has partnered with Arizona State University to offer the Global Freshman Academy, a foundation programme targeted at high school-leavers and others planning to begin undergraduate studies. edX and MIT have also recently announced a new online version of MIT’s Master in Supply Chain Management degree, the MicroMaster’s Credential in Supply Chain Management. “The new MicroMaster’s is an important modular credential for the digital age, and promises to serve as academic currency in a continuous, lifelong learning world,” says edX CEO Anant Agrawal. These early moves to offer academic programmes via MOOCs are best understood as cautious experiments, but also as important signs of things to come. The major MOOC providers are increasingly focused on fee-based credentials, including alternative credentials but also more traditional academic credit options and full degrees, as the foundation of their revenue models. This will lead to an expansion of both alternative and traditional credentials offered via MOOCs in 2016 (and beyond), and to increasing course offerings targeted to traditional prospect pools for higher education institutions, including both high school students and international students. For further early illustrations of this important trend, please see edX’s High School Initiative and FutureLearn’s Going to University course collection. This entry was posted in Africa, Asia, Australia/Oceania, Europe, Middle East, Most Popular, North America, Online Learning, Regions, Research, South & Central America, Technology and tagged higher ed technology, student mobility, study abroad, Most Popular, high schools abroad.